Tank Battle: North Africa, the sequel to the critically acclaimed Tank Battle: 1944 has been released today by video game strategy experts Hunted Cow. 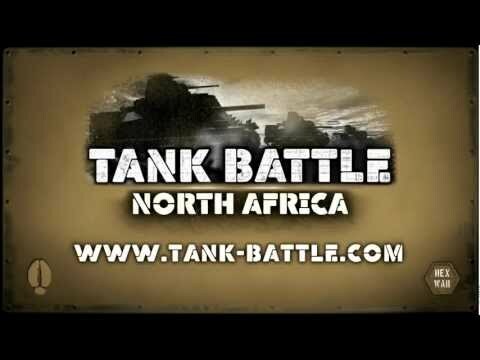 Tank Battle: North Africa recreates the North African theatre of war at the height of the conflict in World War II. Players take control of British and American units and must lead the allies to victory in a series of challenging attacks, raids, defensive actions and battles. Hunted Cow and developer HexWar, have taken the simple, accessible game play of the original Tank Battle: 1944 and added a whole new layer of moves and tactics, giving the player greater flexibility, more choice and new ways to fight in each and every level. The game offers over 35 unit types including many classic WWII units such as the British Crusader Mk III, the German Tiger Mk I, the machine-gun mounted American Jeep and the British 2-pounder anti-tank gun These add greater depth to the game and allow players to create more complex strategies and tactics – all through intuitive, turn-based touch controls, designed and created specifically for the latest generation of iPods, iPhones and iPads. Tank Battle: North Africa offers a five mission tutorial, an eight mission British campaign and eight mission American campaign, offering many hours of intense game play. There are also six multiplayer game levels which allows players to compete on the same device, passing it between them. There are also an additional three campaigns - another eight British and sixteen German missions - which can be purchased directly from the game. Andrew Mulholland, the managing director of Hunted Cow Studios, said, "Tank Battle: 1944 was our first game for iOS and the response to its release was incredible. Players, strategy fans and WWII sites alike all enjoyed the game's controls, accessibility and missions. Many people asked for more and suggested additional content, new units, and ways to give the game more depth. For the sequel we've taken a lot of that on board, as well as many of our own ideas and recreated one of the most famous conflicts in World War II, the North African theatre. We've kept the same, simple and accessible controls, but ensured that every mission can be approached differently and more experienced players as well as those looking for a real challenge can explore the strategy and tactics more fully."